The Atlas of the Human Brain is transformed for the interpretation of any individual MR-image dataset. The MRI dataset is kept untouched. Otherwise the structural characteristics, landmarks and neighbourhood relations may become lost. 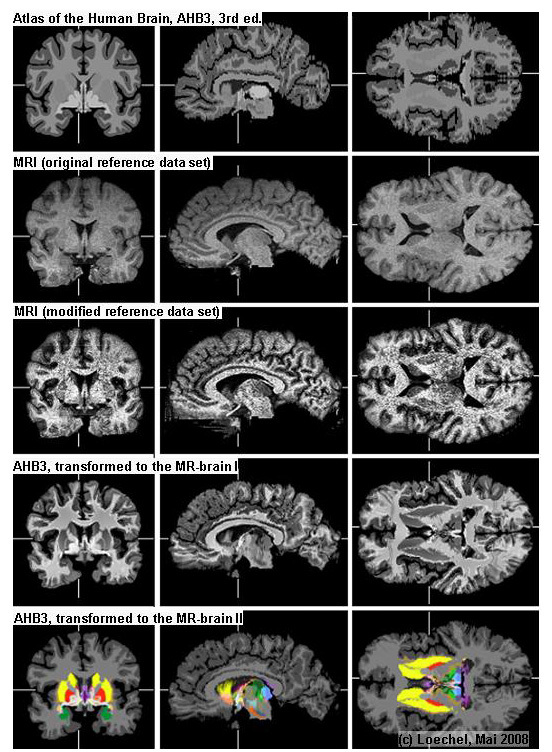 Interpretation of a MRI dataset by the integration with the resource provided by the Atlas of the Human Brain. Upper line: Serial sequence of a MR image data set from a volunteer. 2nd line: Display of orthogonal sections in an html-environment (upper row and lower right quadrant) and reconstruction. Grey level contrast enhancement. Bottom line: Morphological multimodal image-fusion.